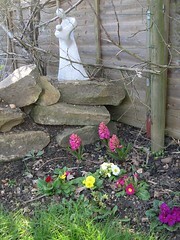 A busy weekend in the Spring sunshine, potting out, planting and sowing. Existing plants are pushing their way through, Autumn plantings are doing nicely, with good colour from the hyancynths, crocus and primulas though they're a bit sparse and will need more planting this year. Tulips are still growing, though this isn't too surprising since most pf them were planted very late. First signs of shoots from lilies in containers (though not in the beds), hopefully they won't get munched by the Scarlet Lily beetles which decimated the container plants last year. 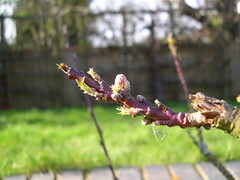 The pear and peach trees are budding. We had some problems with the peaches last year so they'll need wrapping with fleece this weekend since there's a frost forecast. I think I've left the pruning too late for most of the fruit trees, so they'll have to wait until June or July except where the branches are getting in the way. The furtinia is lookng a bit unhappy in its container so it will need planting out into the last gap in the main bed soon- this is good since it will give some winter interest as well as a bit of vertical definition. There are signs of growth from both shallots and garlic, which is very encouraging given how wet the soil was when they were planted. No sign of activity from any of the spuds though. Peas are doing well in the greenhouse, they'll be ready to harden off once the forecast frost has passed before transplanting in 10 days or so. 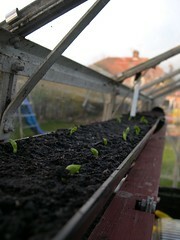 Sweet peas are doing well, and the first few broad beans are coming through. 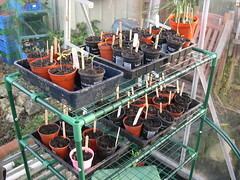 The first batch of tomatoes are safely transplanted into pots and stashed on the new racking, which is filling up fast. I need to get hold of some more guttering- freecycle seems the best idea. Another gutter of peas, planted nearer the centreline of the gutter this time to see if it makes a difference to root growth. A gutter each of lettuce and sping onions. Basil- a six pot tray under a propagator in the greenhouse and a girly pink 6" pot on the kitchen windowsill. Cucumber- 4 in pots on windowsills. Spring onion- single row between the spinach to see if it works as a catch crop.